A very witty and creative silent movie that features some remarkable action, and great moments of slapstick fun. Sherlock Jr. is the best film by the silent actor who was as good as Charlie Chaplin, if not better. 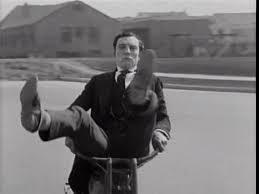 Buster Keaton was a remarkable talent, knowing how to work in this medium, using quick wit and as much story as he could get in, (during the short running time) to bring out the laughs. Sherlock Jr. is only forty-five minutes long and yet it actually has more of a plot than many feature length films. There are two stories going on here at once. The first is about a projectionist who buys a jewelry box for a girl, only to find himself being accused of stealing it. The second story features the projectionist jumping into the movie (during a dream) and becoming the main character there, a detective solving a crime. This leads to all kinds of great action pieces and fun. One of the best involves two villains who have planted an explosive cue ball on the pool table, as well as a chair, where an axe will come down on whoever sits in it. Sherlock Jr. keeps narrowly avoiding these traps, causing the men, who set them up, much distress. This is a very funny, fast-moving, and excellent film. 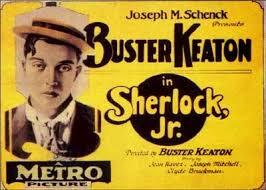 Sherlock Jr. is a Buster Keaton movie with the actor at his finest. It is really the perfect film for showcasing what this actor does and how funny and creative it actually is. For one thing, the movie is only 45 minutes long. Considering it is all just quick skits and fast moving action, that is the perfect length for this. There is a story here, but it is just enough to hold the fun scenes and humorous situations together. At the start of the film, we meet the projectionist, a nice guy who likes to watch the “moving pictures,” he’s showing (just learned where the name movies comes from! Probably first shortened from moving pictures to moving to movies.”) This guy wants to buy a little jewelry box for the girl he likes, and he finds the right amount of money he needs in a pile of trash. No sooner does he do this, however, and the problems begin to arise. One by one, people come up to claim the money he has found. There’s even a guy who finds a lot more than the projectionist found in the pile. In the end, we get the funny punch line of the projectionist diving headfirst into the pile of trash to rip through it and search for more money. This is just the opening skit, but it sets the tone of quick humor with a minimal plot. Things get better as the plot starts to turn into a mystery. The projectionist goes to visit the girl’s house and give her the box. He changes the price amount on the box to 4 dollars, so that she will think he paid more than he actually did. Well, there’s a thief at the house who stole the father’s watch. This thief has since pawned the watch and has a receipt showing that he sold it for exactly four dollars. He slips the receipt in the projectionist’s pocket and then finds it and compares it to the price on the box, for everyone to see. It seems obvious that the projectionist stole the watch, pawned it for 4 dollars, and then bought the box. He is kicked out of the girl’s house. The projectionist returns to the movie theater where there is a detective movie showing on the screen. He falls asleep in his chair, and during his dream, the projectionist steps out of the sleeping body, walks down the aisle and jumps into the movie screen. He now becomes a part of the movie. But things don’t go so smoothly for him the second he gets in. there is not an easy transition here from one world to another. Instead, the projectionist constantly tries to find a place where he can walk around without running the risk of falling off something. That’s because the background he is in constantly changes. One second he is on the edge of a cliff, the next he is in the middle of a street, and it keeps changing over and over again. The projectionist goes from walking around to just standing still, but even that is not enough. So he decides to just sit down, and the background changes to a beach with a wave coming right up behind him and crashing over his back. The movie reaches it’s high point when this turns into a detective film. The story on the screen is that there is a wealthy house where a thief has stolen something from the owner. This is meant to parallel the story that is happening in real life with the projectionist. In the screen story, the man who was robbed has called for a detective. That detective is Sherlock jar. and he is played by buster Keaton, the same actor playing the projectionist in the real life story. We get some fantastic scenes with Sherlock jar. as the detective who knows more than he lets on. The thief is working with the butler and the two of them plan to use traps around the house to kill Sherlock jr. one of them is a pool ball that will blow up when it is struck. Another is an axe that will drop down on a chair when someone sits in it. Sherlock jr. is onto these tricks and he toys with the men who set them up. He has a very fun game of pool with the bad guys hiding outside the room, peeking in to see his every move, and he keeps narrowly avoiding sitting in the chair or sitting in it long enough for the axe to fall down. As great as that pool table room scene was, the movie gets even better. The action picks up when Sherlock jar. finds the bad guy’s secret hideout and ends up being chased by them. He has an assistant who is constantly in disguise to the point where he even fools Sherlock, and the assistant shows up whenever Sherlock is in danger, to help him out. That might mean providing a suitcase and jacket for Sherlock to jump through, or having a racing bicycle for him to sit on the front of while the assistant peddles away. When the assistant falls off, and the bicycle becomes a runaway with Sherlock just sitting on the front, we get the funniest and most exciting sequence of the movie. My favorite moment of it is when the men shoveling all throw dirt on him as he rides by, but there are sure a lot of great ones to choose from. Sherlock jar. is a fantastic movie for all sorts of reasons. For one thing, it absolutely gets better and better the longer it goes on. It builds in excitement with each scene leading to a fantastic finalize. The movie is smart enough to not waste anytime and to give us a lot of story in a small 45 minute running time. After all, there are actually two stories going on here at once. The first is the story of the projectionist and the second is the story about the detective. I like that while one story is going on, we still cut back to the other, so that while the detective is dealing with his villains, we see the girl in the other story, go to the store, and try to find out who pawned the watch. There is both romance and action and they are both fueled by some really clever humor. This is an absolutely great film.